60-90% of the population will experience back pain in Singapore. Chances are you or someone you know has suffered from back pain at some point in their life. It can catch you by surprise and drastically limit your mobility and function. 1 in 2 employees took 4-7 days off work for their back pain in the past year. It decreases productivity and one’s quality of life. However, back pain doesn’t have to be the norm. At the Singapore Sports and Orthopaedic Clinic, our experts can help you bounce back from back pain and prevent future incidents. The back is a complicated structure, consisting of neural networks, the spine, and muscles. However, everything in the body is connected. Back pain may be caused by a tight muscle, structural abnormalities, neurological issues such as nerve compression, and more. The spine consists of small bones called vertebrae. In between each bone is a disc. These discs prevent bone-on-bone contact, as well as act as shock-absorbers. Within the spine is the spinal cord. The spinal cord contains the nerves that connect the central nervous system to the rest of the body, allowing your brain to communicate to your muscles and joints to perform certain movements. Further, muscles connect to various points of the spine and pelvis. The condition of these muscles, such as strength and flexibility, can impact your posture and alignment. If these muscles aren’t functioning properly, back pain may occur. There are a variety of causes of back pain. Some of the most common causes include a slipped disc, osteoarthritis, poor posture, and tight muscles. A slipped disc, or herniated disc, is the displacement of the shock absorbing disc in between the spinal vertebrae. It may occur due to twisting or moving incorrectly or due to wear and tear over time. Consequently, it may place pressure on nearby nerves. ‘Sciatica’ is the common term used in conjunction with a slipped disc condition. The disc may place pressure on the sciatic nerve, causing numbness, pain, tingling, and weakness to occur down the legs. It frequently occurs in the neck or low back, and may cause varying degrees of pain and functional limitations. Your body is made to move a certain way. Further, your joints, muscles, and tissues are optimized for proper posture. Unfortunately, a lot of people lack proper posture. Today, many people lead fairly sedentary lives. We sit at desks all day, jeopardizing our posture and causing certain muscles to shorten. Flexibility and strength decrease. When we place our body in unnatural positions, dysfunctions occur. For example, if you are leaning forward all day with your head protruding toward your computer screen, you are placing stress on your neck and shoulder muscles, bones, and tissues. Bad posture can also lead to added stress on the lower back. The body isn’t made to sit in such positions for prolonged periods. And as much as it tries to adapt, back pain is often inevitable without proper intervention or education. Sitting for long periods may also contribute to tight muscles. The hamstrings, hip flexors, and piriformis muscles may become tense or shortened. Due to their attachment points and locations, these muscles can pull on the pelvis and spine causing pain. Frequently called ‘Piriformis Syndrome,’ the piriformis muscle may spasm and compress the sciatic nerve creating radiating pain down the legs. However, sports doctor can educate you and help you overcome these conditions. With proper treatment and care, you can decrease and eliminate your back pain issues. How is Back Pain Treated in Singapore? Back pain is treated in a number of ways. It frequently depends on the cause. Pain relievers, such as over-the-counter NSAIDs, may help decrease initial pain and inflammation. However, it isn’t recommended to use these medications in the long-term. Negative side-effects, including gastrointestinal issues, may occur with chronic use. Exercise, supervised and provided by a trained professional, can help decrease your risk of back pain and eliminate future injuries. Frequently, back pain in Singapore is caused by inactivity and muscle weakness. The most common form of rehab exercise for back pain involves the strengthening of the neglected transverse abdominals, or TA. The TA muscles are the deep and lower core muscles. They help support and stabilize the spine and pelvis, acting as a girdle. When this muscle is weak, we try to compensate in other ways. However, this often results in injury and pain, specifically in the low back. Lying face up, with your knees bent and your feet planted on the ground. Imagine a tightrope pulling your hip bones together or stopping the flow of urine. You can feel with your fingers in between your hip bones to determine if you are tightening your TA muscle or not. Your stomach should not bulge upward, just tighten. Your low back should remain on the ground or bed. Make sure to keep breathing throughout the exercise. A lot of people tend to hold their breath. However, this is incorrect. Try holding the contraction for 5 seconds to start. Build up to 10 second holds. Perform the exercise 10-12 times and at least 2-3 times per day. Common problematic muscles that may also lead to back pain, include the hamstrings, hip flexors, and piriformis. The hamstrings or hip flexors may become tight, which may pull on the pelvis. In turn, this creates alignment issues. Your lower back may become under stress in this unnatural position. Thus, pain may occur. To correct these issues, your sports doctor will prescribe exercises to stretch out and elongate these muscles. They may also use manual techniques to promote healing and to release muscular tension. The piriformis, as aforementioned, can spasm and compress the sciatic nerve, causing back pain and radiating pain down the legs. Myofascial release techniques and stretches can help release this small muscle, reducing and preventing future incidences. In combination with exercise, a manual therapist or sport doctor can perform joint manipulations, traction, myofascial release, and other techniques to help alleviate your pain levels. Each treatment protocol is suited to your particular needs. In severe cases and where other treatment options fail to work, surgery may be used as a last resort. At the Singapore Sports and Orthopaedic Clinic, our sports doctor are qualified to perform such surgeries. They can prepare you before surgery and help guide recovery post-surgery. Discectomy: This surgery may be performed when an individual has a slipped disc. The doctors removes the damaged part of the disc. 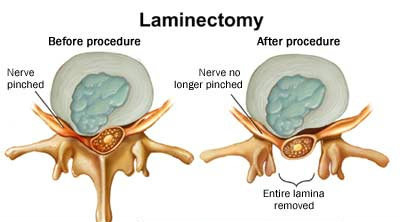 Laminectomy: Spinal stenosis is the narrowing of the spinal column, which can cause neural issues to arise. In this type of surgery, the lamina portion of the spine is removed to relieve pressure on the spinal cord. Spinal Fusion: 2 or more vertebrae are fused together in this type of surgery. It limits movement between the 2 vertebrae, reducing pain brought on by the motion of these 2 bones. This is often done in cases where the spine has been damaged or a deformity has occurred. Your sports doctor will thoroughly explain the surgery prior to. Again, these surgeries are only performed when all other interventions and treatments have been unsuccessful. Frequently, surgery will improve one’s pain levels. However, in some cases, it may not fully fix the problem. Exercises and other treatment protocols can help manage the remaining pain post-surgery. At the Singapore Sports and Orthopaedic Clinic, our injury experts can help you thwart back pain in Singapore and get you back to your regular activities. Your sport doctor will conduct a thorough assessment. From their assessment, they will come up with an appropriate treatment plan, including exercise, manual techniques, and education. Call or visit our clinic today! Regain back control of your life and rid yourself of back pain for good. Chronic back pain is a condition that many people go through but too often overlooked or treated with wrong methods because of common misconceptions. Like other similar medical conditions, chronic back pain should be diagnosed and can be treated and managed, as long as these mistaken beliefs are out of the way. 1) Resting in bed helps to recover from back pain. While resting in bed for 1 to 2 days is recommended to reduce stress on the discs of the spine and lessen the pain, any longer than that would backfire on the recovery. Long hours in bed would cause an increase in pain, muscle atrophy, loss in bone mineral and a higher risk of blood clots forming due to the lack of movement. Contrary to popular beliefs, patients with chronic back pain should not rest for too long. On the other hand, doing back exercises regularly would strengthen the muscles and speed up recovery. 2) Only painkillers can help to relief pain. Painkillers may be prescribed to help manage the pain for daily activities. However, without proper treatment, the condition does not get better. 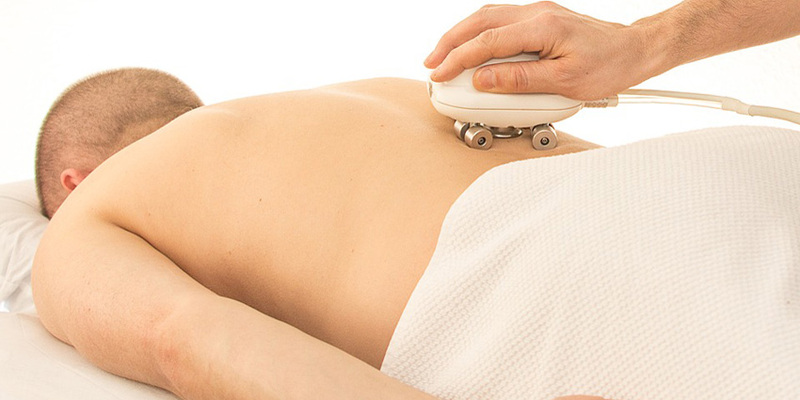 Physical therapy like ultrasound treatment and electrotherapy can help to reduce the inflammation and joint mobilization helps to decrease tension in the muscles. Other pain management methods include having a healthy diet, a better sleep routine and exercising. 3) The pain would go away with heat and back massage. Heat and massage would help to manage pain for the short-term. But for chronic pain, the soothing effect wears off and the pain would be just as bad as before. This method is good if you just need a quick alleviation from acute pain. However, the condition would not get any better without appropriate treatment advised by the doctor. 4) Chronic back pain is a natural occurrence of aging. Many people live with chronic back pain undiagnosed and untreated, thinking that the symptoms are due to aging. Back pain can happen to people of any age, with or without injury. In fact, those that go through chronic back pain at a younger age tend to feel less pain when they get older with proper treatment and exercise. Even though disc degeneration occurs between ages 35 and 55, it does not necessarily come with pain. Never ignore any kind of pain or discomfort and always get it checked. 5) If I have chronic back pain, I should not exercise. Exercising helps strengthen the back muscles, giving a stronger support for the spine. Though vigorous exercises that add pressure on the back should be avoided, regular light exercises are good for long-term recovery. How Does Yoga Reduce Orthopaedic Injuries? No one in this world is born perfect. There are imbalances in various parts of our body and this can cause injuries if mishandled. Many sports athletes are now turning to an ancient form of practice – Yoga. Yoga helps to increase the flexibility and physical as well as mental strength of oneself. It helps to prevent injuries associated with overuse and speed up recovery of existing injuries. Yoga is normally conducted in a room that is slightly warm. This increase in temperature will allow muscles to expand and relax, allowing for an increase in stretching capabilities. Enhanced stretching will help to lower the risk of injuries. Yoga will help to build up physical strength and tone muscles, especially vulnerable ones such as the back muscles. It also increases flexibility, reducing injuries that are sustained due to the inability to flex. Since yoga causes perspiration, it will draw out toxins and impurities from the body, burn excess calories and help to build up endurance levels. Orthopaedic injuries are all about the joints and musculoskeletal system. Having strong joints and muscles will help to significantly lower the risk of injuries. For example, athletes that are involved in high tempo activities such as basketball and soccer are at a high risk of ankle sprains. Due to the constant running and jumping motion, this causes a lot of high stresses to build up at the joints. Without sufficient rest, it can lead to overuse injuries and eventually soft tissue damages. Not only does yoga help to strengthen these joints, it also helps to reduce body weight to reduce the cyclic stresses acting on weak areas of the body. You may be thinking basic warm up and cool down stretches also help to increase body heat and relax the muscles, increasing flexibility. What is so special about yoga? Well, the main difference is that yoga goes beyond stretching the “common” muscles. Normal stretches simply stretch the muscles in a one direction plane. However, this is rather useless for sports since sports is a 3 dimensional activity whereby the stresses come in the x, y and z plane. Yoga helps to stretch all the muscles in all the directions including the small ones to better prepare for what is to come during the games. Additionally, how yoga differs from ordinary stretching lies in its breathing during the practice. The emphasis of muscles isolation, works on specific muscles and in general stronger muscles would reduce the risk of sustaining orthopaedic injuries. In fact, stronger muscles also reduce the extent of an injury as well as recovery rate. Generally a stronger individual would be able to recover faster than an individual with weak muscles. Yoga is an ancient activity that helps to warm up your muscles, increase the flexibility and build up your physical and mental strength through various poses and motion. With thousands of years of history, it is tried and tested by many. Relief from back pain can be obtained from simple back exercises that helps to stretch, loosen and strengthen the back muscles. Our body is designed in a way that the back muscles must work in tandem with the spinal cord and the soft tissues such as the ligaments and tendons. If there are any restriction to the movement, it will cause discomfort and pain for the patient. Back pain is an orthopaedic condition that requires special attention to be given to it. There are some good exercises that can help to provide pain relief and let’s discuss them below. Lie down on a gym mat or on your bed depending on your comfort level as different surfaces will provide different level of pressure. Lay on one side of your body and place an exercise ball beneath it. The ball should be positioned at the muscular region at the side of the spine and slowly place your entire body weight onto the exercise ball. Do not attempt to move about or bounce up and down. Sit down on a chair that does not have any rollers. Place both of your feet firmly on the ground and sit upright. Slowly start to lean forward and stretch towards your toes while keeping your neck in a relaxed position. When you feel tightness in your back, hold in that position for 15 seconds and slowly return to the original position. Repeat this exercise for 10 times and whenever you can throughout the day. This will help to stretch and relax the back muscles. Lie down on a soft surface such as a gym mat or on your bed. Maintain a straight posture and slowly bring both of your knees towards your chest. You should be able to feel tightness in your back and hold in that position for 15 seconds. Repeat this exercise for 10 times and whenever you can throughout the day. This will help to stretch and relax the back muscles. Strong gluteus muscles can help to better support the body’s weight and take some load off the spinal cord. The piriformis muscles is at the buttock region and if the muscles are weak, it can cause pain in the lower back. Lie down on a soft surface and place one leg over the other and pull towards your stomach. You will be able to feel a tightening sensation at the buttock region and hold for 15 seconds. Slowly return to the starting position and change legs. Repeat this exercise for 20 times. Exercises will help to stretch and strengthen the back muscles to provide pain relief. Most exercises require minimal space and can be performed throughout the day whenever you are free. Do not attempt to stretch beyond your limits and remember not to over exert the injured muscles. Work is literally a pain in the body. Don’t you frequently experience pain throughout your body when you return home from work? Studies have concluded that white collar professionals are the ones that have the highest medical claims among all occupations. White collar workers and blue collar workers suffer different pain mainly due to their different job scope. White collar workers sit at their desk the entire day and it does not seem to be hard work at all. However, they often reach home with muscle aches everywhere. Sitting on the chair for prolonged periods can cause a lot of pressure and straining on the back muscles. This is commonly termed as mouse shoulder. You can also experience chronic stiffness in the upper back, lower back and spinal cord. Sitting down for too long will cause the spinal discs to compress and cram up as well as causing inflexibility in the hips which will increase stress levels in the lower back. Typing injury or repetitive stress injury as its name suggests implies pain in the hands that are caused by repeated typing motions and this will cause even simple daily activities to be almost impossible. This is due to the repeated stresses acting on the tendons and ligaments of the hands. This can cause the ligaments to be inflamed and swell up as a result. Staring at the computer screen for the entire will put a lot of strain on the eyes and will leave it dry and tired, eventually leading to blurry vision, headache and eye pain. Doing repeated motions every single day in the office can cause muscle overuse and lead to ligament and tendon injuries as well as cause muscle aches. Stiffness of the neck is also another common complaint that many white collar workers have. Due to the prolonged periods of computer usage, the neck is kept in a position unmoved due to the need to view the computer screen. The mistake of setting the monitor height at an incorrect height further aggravates the problem. Many office workers also experience migraines during work and this can ruin a day badly. The exact cause for migraine is still unsure but this is largely due to the prolonged staring at computer screens. All it takes is just some adjustment to office ergonomics that will lead to a vast improvement in terms of posture and working conditions. Setting the monitor screens at the correct height and the screen brightness to the correct setting can eliminate headaches and even migraines. Sitting upright can reduce chances of back problems.